The implementation of a parallel algorithmf o r estimating non-rigid motion vectors using a semi-$uid motion model applied to time-varying satellite imagery is described. De- formable motion tracking of non-rigid biological objects and remotely sensed objects such as clouds, atmospheric aerosols and gases, polar sea ice, or ocean currents are important application domains f o r the Semi-fluid Motion Analysis (SMA)algorithm. Thefocus of this paper is on the parallelization of the SMA algorithmfor the MasPar MP-2 architecture. 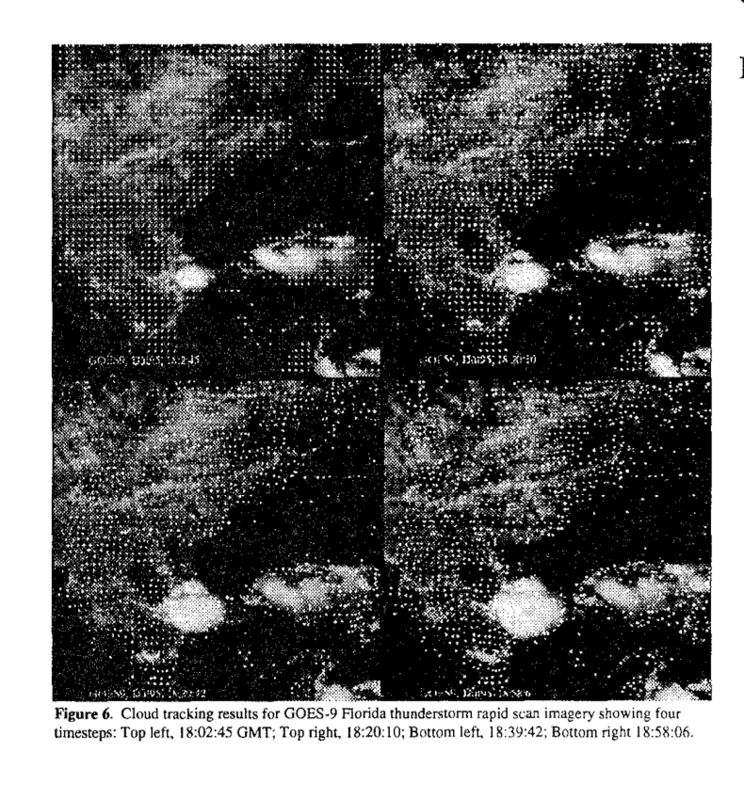 Implementation issues that were evaluated in order to make itfeasible to explore dense semi-jluid motion estimates of rapid-scan time-varying geostationary satel- lite imagery of clouds and weather pattems are described. Cloud motion vectorsfrom the SMA algorithm can be used toestimatethewind$eld thatwouldbeusefulinavariety of meteorological applications. Comparisons between the parallel and sequential implementations of the SMA algo- rithm, and with manual results are briejly discussed. K. Palaniappan, M. Faisal, C. Kambhamettu, and A. F. Hasler. Implementation of an automatic semi-fluid motion analysis algorithm on a massively parallel computer. 10th IEEE Int. Parallel Processing Symp., pages 864--872, 1996.